January job gains exceeded expectations, but a true recovery remains elusive. Today’s job numbers were a welcome surprise: 243,000 people were added to payrolls in the past month, which is far more than the 140,000 analysts were predicting. Encouragingly, the gains were broad across came in many sectors: manufacturing, construction, temporary help agencies, accounting firms, restaurants and retailers. It was the biggest job growth since April, and it brought the unemployment rate down to 8.3 percent. As has been the case since the crash, however, there’s a huge “but” here. The economy, while improving, is still in rough shape and the country is suffering from a massive jobs deficit. There are 5.6 million fewer jobs now than in December 2007. There are four job-seekers for every job, and long-term unemployment is still far too high, at over 40 percent. Immediate help could come by an extension of unemployment benefits, which are set to expire (again) at the end of this month after the December payroll tax compromise punted the issue. But beyond that, serious government action on jobs is needed to nurture these small increases and create a serious push towards a real growth. As always, the jobs numbers are already becoming a political football. I haven’t actually seen any irrational exuberance from Democrats yet—perhaps they are wise not to chain themselves to something so fragile. Republicans are (fairly) noting how bad the situation still is, but (unfairly) blaming administration policies. House Speaker John Boehner blasted out a press release this morning titled “We Can Do Better,” and Mitt Romney said he “welcomed” the increase but “these numbers can’t hide the fact that the President’s policies have prevented a true recovery.” Note: despite the broad increases across many sectors, 14,000 government jobs were lost in the past month—no doubt fueled by Republican austerity politics and the national and state levels. Manufacturing numbers are truly encouraging—50,000 jobs were added, which is the largest one-month increase since August 1998, according to the Alliance for American Manufacturing. 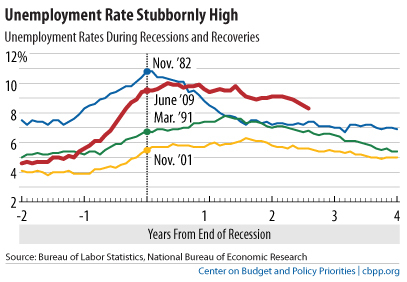 Part of this, of course, is that there are so many lost jobs to regain, but the growth is encouraging. Last month, I noted that veterans were left behind in the modest employment gains. Bucking the recent downward trend, January’s veteran unemployment level decreased, from 13 to 9 percent. Last fall, the only part of Obama’s jobs plan to pass was focused directly at veterans, providing tax breaks for hiring and job-retraining programs. Funny how that works.